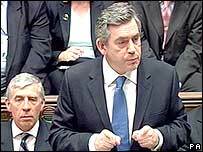 Gordon Brown and David Cameron have clashed over plans to introduce identity cards in their first prime minister's questions encounter. Mr Cameron, whose Conservatives oppose the cards, said they would "cause more problems than they solve" and had not stopped terror attacks abroad. But Mr Brown, who raised the issue, said they were needed as they were "complementary" to other policies. He called on all political parties to show "unity in the face of terror". Mr Cameron urged the prime minister to introduce a border police force, which would "make a real difference", instead of ID cards. He said the idea of a border police force was backed by the Commons home affairs committee, by new government adviser Lord Stevens and by the current Met police chief. He quoted Mr Brown's new chancellor, Alistair Darling, as having said in the past: "Identity cards are unnecessary and will create more difficulties than they will solve. I don't want my whole life to be reduced to a magnetic strip on a plastic card." Mr Cameron added: "ID cards did not stop the Madrid bombings. After the 7 July bombings the then home secretary said they wouldn't have helped in the UK, they wouldn't come in for years and they'd cost billions of pounds - money that should be spent on things like a border police." But Mr Brown said the Tories' new security spokeswoman, Dame Pauline Neville Jones, Lord Stevens and "many on the Conservative backbenches" believed that identity cards were needed now. He said times had moved on since the quoted comments from Mr Darling, saying: "It is because the situation has changed that more and more people have come to the view that is taken by your security expert, that we need identity cards." Pressed by Mr Cameron on whether he would ban extremist group Hizb ut Tahrir, Mr Brown said more "evidence" was needed before doing so. A review on using phone-tap evidence in court would also go ahead, he added. Mr Brown revealed that Security Minister Lord West is to carry out a review of the National Health Service in the wake of the attempted bomb attacks in London and Glasgow. But the prime minister caused howls of derision from the opposition benches when he reminded Mr Cameron he had "only been in the job five days". Former home secretary John Reid praised the "cool and steadfast way in which he [Mr Brown] and the new home secretary have handled these difficult circumstances". Questioned by Liberal Democrat leader Sir Menzies Campbell, Mr Brown refused to give a date for the withdrawal of British troops from Iraq. He said: ''It would be wrong to set a timetable at this stage. What we have done is reduce the number of troops from 44,000 to 5,500. "What we have also done is move from combat to over watch in three provinces of Iraq." The government was "not going to break [its] obligations" to the Iraqi government and the United Nations, Mr Brown said. Last week's PMQs saw outgoing Prime Minister Tony Blair receive a standing ovation from Labour and opposition MPs.